I haven't been doing many 'tags' lately, or quizzes, so I've decided to link up to one I found that looked like fun. 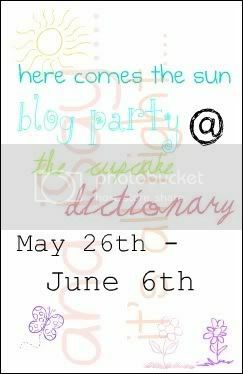 The 'blog party' is actually called 'here comes the sun' -- and if you're like me & can't wait for summer, you can see why I thought this might be fun. What would your dream summer vacation be?Let's see. Sudan, perhaps. I know, that's crazy, it's even hotter there -- but I used to live there, so it would be nice to go back. Even in the summer. If not Sudan, Georgia. Can't you see I like hot places? After a rainstorm, what you think of when you see the sun peeking out from the clouds? I'd probably get happy because that means we can go outside. Plus there might even be a rainbow when the sun peeks out, ant that's always lovely. If you were stranded on a desert island with the sun streaming down on you and had ONE palm tree for shade, you can only have three things with you; what would they be? A water gun, a tent, and granola bars. Vanilla, chocolate, strawberry or neopolitan? If you saw your celebrity crush walking down the beach with a surfboard, what would you do? If you went back in time for a day, what era would you go back to, and why? Can I go to Narnia instead? What's your favorite thing about waking up on a summer morning? The sun. And the birds. Say you went to California to visit family. What's the first thing you would buy? I don't have family in California, but I'd probably buy a snack there first. Uh, sorry again people -- I have no idea what a manicure or a pedicure or a facial is...car parts? I'm horrible at automobiles. And that kinda stuff. Golden yellow & light blue. Like my blog design. If you were at the beach and you wanted to write a message in the sand, what would you write? You're stuck in Paris with $10,000. What do you do? Eeek! I'd look at the sites perhaps, spend a little money, take tons of pictures, then head home and safe the extra money. I'd have loads left for trips to Sudan & Georgia. What's your most favorite type of summer weather? Blowing bubbles while taking a bubble bath? No thanks. I don't take baths. I take showers and I time myself to see how fast I can go. Yesterday it was two minutes, today it was three. Uhmm..dictionaries. I know. I'm crazy. This tag DOES look like fun. :D I can see why you want to come to Georgia. Cause I'm here, DUH. RAL, jk.